So glad you stopped by my blog, I hope I leave you with some positive inspiration! My friend gave me a small burlap canvas and after coveting it for a while I finally figured out what I wanted to use it for. Something vintage and meaningful for me. Love. This was a very easy to make canvas, I had saved the chalkboard label of some flower packaging and used it for the background. 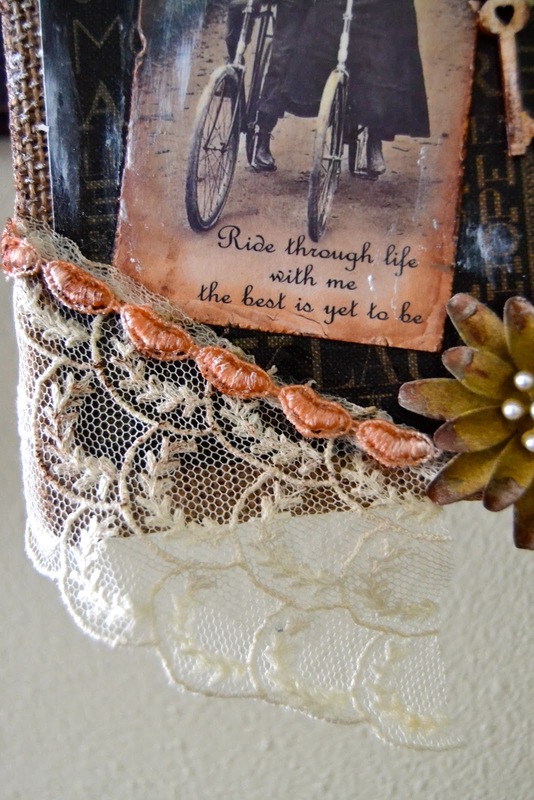 Then I distressed the image and added my grandmother-in-laws old lace to it. Some metal flowers and a smudging of white paint and done! I also want to bring your attention to a wooden key, it is chunky and a small part of the most amazing chipboard I have been working with this month. There will be more chipboard coming soon to show you as I am part of Southern Ridge Trading Company design team. They just put together a blog here to start our showing you all the things you can do with Karen's chipboard that she creates herself. The fun part is we can ask her or give her ideas of what we want and she makes it! So stay tuned for next week as the blog begins! I wanted to show you this gorgeous lace that is 100 years old. It has been salvaged by my mother in law and so I use it sparingly on items to keep. Look Familiar! Wow what a winter we are having in MN, it is one for the record books. High winds to blow the snow and shut off our driveway and road. It is very beautiful but crispy cold in the negatives way too much!! Thank you for stopping by today and I hope you have a very nice weekend coming up!! What a beautiful vintage piece, Kelly - the image is glorious, and I love that you used the packaging behind it. Lovely - and so worth the addition of your precious lace. Excited by your news and to see more chipboard (am developing a bit of an addiction)... And envious of your snow too, though I can understand it makes life hard!! Oh Kelly, your piece of lace is just exquisite and your burlap panel is so very beautiful, it does not look like it was easy at all, your design is just perfect. Looks like we are both starting off on new adventures - many congratulations to you, they must be thrilled to have such a talented lady on their DT! Oh Wow! this is so beautiful Kelly… what an awesome image and sentiment! I love the gorgeous textures and the pretty flowers and lace… Wow! how wonderful that it is 100 years old… just perfect for this vintage canvas! Oh boy… look at all that snow! we have got some forecast for this weekend… but hopefully we will get just a sprinkling!! Roll on Spring eh? Love It!!!!!!! It's so perfectly vintage. Such a lovely vintage creation, the lace is so beautiful ! Aw the snow ! There's so winter this year here, strange weather ! Hello Kelly! Wonderful creation ! this lace is exquisite and so delicate! OMG. I don't know how you were able to cut it! lovely snow! makes great pictures. LOL Hugs. Looks like my yard, Kelly!!!! 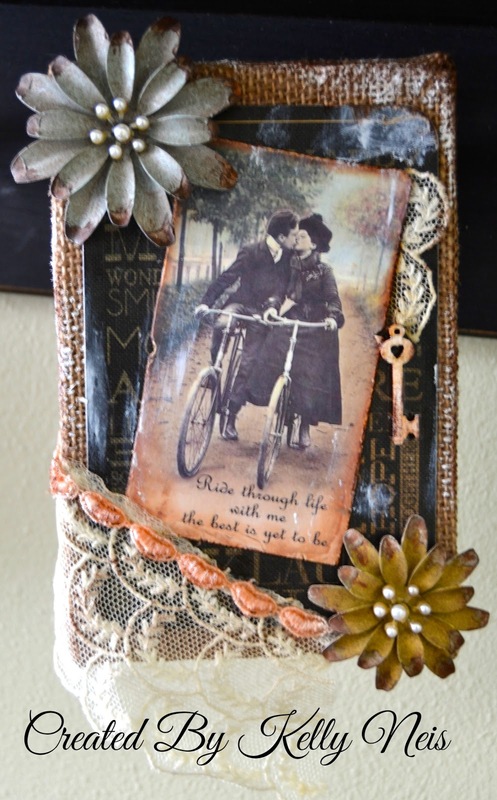 Your canvas is beautiful.....vintage at its best! I am sure you treasure this lovely lace since it is so meaningful to you. Take care, my friend, and keep warm! Love your vintage canvas! Especially that beautiful flower and gorgeous lace!!! That snow looks amazing! Wow! I believe you gave me some of this lace - now I just have to learn how to use it. Your canvas is very pretty and it looks like you have a new DT position. Congratulations! I am looking forward to seeing what you will be doing with the chipboard. Love love your canvas! Absolutely gorgeous!! The snow.....not so much. lol Looks like more of it is on it's way. I love this canvas and everything about it! Beautiful nostalgic and vintage look and is so pretty I have to go back and look again. Oh yes, the snow... pretty to some but I am so over it and want spring to get here soon. 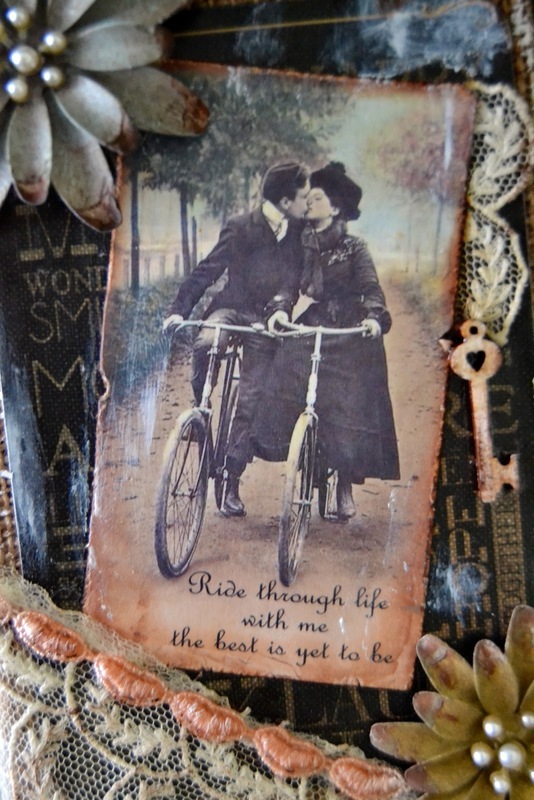 I love this vintage canvas! That lace is scrumptious and I too would of had a problem cutting any of it. The burlap background is perfect. Great design! Your pics of the snow are great but lets see some tulips!!!! LOL!! This is soooo cool!!!! Congrats on you new DT position. ROTFLMAO!! Ok seriously though - I luv it!! That lace?!! OMG I'm impressed you're not hoarding it!! I'm really sorry about your snow - ew. Those pictures are almost like swear words. LOL! ahhhh soon!! I hope!! Hi Kelly! Wowwwww, this is such a GORGEOUS vintage creation and that lace!!! OMGosh! Soooooooo BEAUTIFUL! It must've been so difficult to cut .. I've had those moments where I almost feel sweaty cause I don't wanna cut into something so treasured! LOL!!! Can't wait to see your creations with the chipboard!!! I know it's going to be AMAZING like always! Hope you and your family are having a lovely weekend Sweetie! Beautiful canvas! love the vintage feel and the flowers are fantastic. I can't believe the lace is 100 years old, such a treasure!